Craving alternative literature, an unconventional heroine and a downright weird premise? 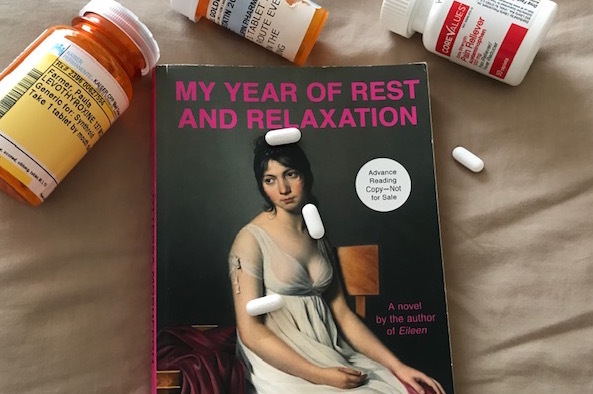 “My Year of Rest and Relaxation” by award winning writer Ottessa Moshfegh is just what the literary doctor prescribes … And when you read this bodacious new novel, you’ll appreciate the aforementioned cliche. This weird and trippy novel, set in 2000 through 2001, is about a young, pretty Columbia University grad who after the death of her parents, breakup with her boyfriend, and dismissal from her job, is overcome with depression and lifelessness. She decides to drop out of life for a year through overmedication (prescription) and hibernation in her Upper Eastside apartment in New York. Of course, her inheritance affords her the opportunity to retire, so to speak, and retreat into seclusion. She is convinced that if she can just get enough sleep, she’ll awakened renewed and invigorated, back to tackle life in more traditional ways. For the first six months, she is mostly dedicated to her personal cause and case study, only advancing from her cocoon for her monthly pharmacologist appointment, and sustenance, which consists of cola, coffee, tuna salad and animal cracker. In between such outings, she is occasionally and reluctantly rustled out of slumber by her one “friend,” Reva, who for the most part does not even notice that her friend has checked out. Reva herself is a depressed character who parties hard and perpetuates an ill-fated affair with her married boss. She insists entry into our heroine’s apartment after drug induced nights of hard partying and a need for company while she wallows in her sorrows. Out of frustration and pity, she is allowed in and forced to sit silently why the narrator re-watches a favorite old movie before giving Reva the boot and passing out. Despite Reva’s efforts for bonding, the narrator only becomes more resolute in limiting outside intrusion. The following six months, finds the narrator more committed to her experiment, refusing to be distracted and enlisting the help of a former work associate who has a personal stake in a successful outcome. The book is mostly made of these hallucinatory sort of narrations and ruminations, which will either entice some readers within the first two chapters, or turn them off. This is an unsettling and unsympathetic character, and even stranger story, with not much going on but a clearly depressed person desperate to withdraw. Yet there is something intriguing about it all. The rare glimpses of humanity and vulnerability from the narrator are gems that perpetuate you to the next few chapters of her banal existence. And then there’s the final three chapter as she reaches the finish line, emerging from experimental year slumber and self induced alienation, creepy towards 9-11. Like the narrator, you feel as if awakening and a reluctant embrace of life such as it is, a glimmer of hope. Unfortunately, these chapters are short and thin. Although successful in leaving you wanting for more, you can’t help but wonder if the 273 pages prior were worth the brief pay off at story’s end. That being said, I didn’t think I’d finish the book, let alone find myself intrigued and appreciating it on several levels. Although I think it might have been better suited as a novella, it is undeniably unique. In addition to being considered literary fiction, one could be tempted to label this novel as black comedy, but in actuality it defies categorization and genre. Moshfegh has carved out her own niche and she does not suffer critics of her writing and characters lightly. You either get it or you don’t; hate it or love it, but you should try it on for size. My Year of Rest and Relaxation is writer Ottessa Moshfegh’s follow up to her award winning novel Eileen and her novella McGlue.